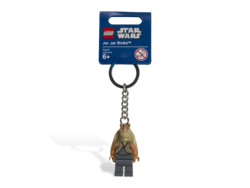 853201 Jar Jar Binks Key Chain is a Star Wars Key Chain released in 2011, featuring Jar Jar Binks. Jar Jar has dark grey legs. He wears a dark grey shirt, and a ragged light brown jacket. He has dark orange arms and hands. He has a uniquely moulded headpiece, with a long, projecting mouth, and long ears that go all the way down the back of his torso. A large chain is attached by means of a metal pike into his head. The chain is attached to a key chain ring. This is a description taken from LEGO.com. Please do not modify it. Go everywhere with the greatest Gungan in the galaxy! Get moving on the road or on an intergalactic adventure with the hero of Naboo! Fight for the Republic anywhere with the Jar Jar Binks minifigure attached to a sturdy metal ring and chain. A great gift for any LEGO® Star Wars™ fan. Facts about "853201 Jar Jar Binks Key Chain"
Go everywhere with the greatest Gungan in the galaxy!